Yes it looks ok as long as its not too hot. I sometimes wear a amira hijab and on it a larger hijab. I love to use the amira under coz they keep the hair in place. I love your blog and check it almost daily for hijabspiration. I've only been wearing hijab and longer tops now for a little while and I was so clueless about what to wear now. Jazak'Allah Khair for all your hard work. Sis, I tend to just use the cap, rahter than the whole thing, as I find the adult size ones are often too bulky. Thanks anon, I'm glad you found the blog useful! In hot weather, try georgette hijabs - they are light and great at keeping you cool, although I often have a hard time keeping them in place! medic, I had this problem the other day as well. I usually put mine in from underneath anyway - putting it in from the sides tends to rip my hijab. 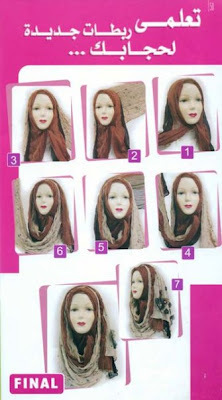 What usually works for me though is to pin one end of the shayla at the back of the neck, then wrap the other end around the head again, bringing it under the chin and up over the side again, then pin at the top of the head. Hope that makes sense! Ah, i always wear my hijab loosely, (Gulf way), however this style is gorgeous yet simple... but it doesn't work for me.. i don't understand it..
perhaps an alternative suggestion: video explaining this hijab style?